This is the seventh image in the series. Earlier images start at the leftmost edge of the pharynx and subsequent images go consecutively deeper, until the last goes through the very rightmost edge. The focal planes are not equally spaced. They were chosen so that all the nuclei in the terminal bulb would be clearly visible in at least one image. Identification: All the pm5 nuclei are large fried eggs. The two pm5V nuclei are found in the ventral anterior terminal bulb just anterior to I5. The two ventral nuclei are found in the ventral anterior terminal bulb just anterior to I5. They are very close together on either side of the ventral midline. The lateral and dorsal pm5 nuclei are at the same A/P level of the TB. Together with g1A, they form a triangular cluster in the subdorsal anterior terminal bulb, dorsal to the pm5V nuclei. The ventral and dorsal nuclei are anterior of g1A, which is anterior ventral of a neuron (M1 on the right, I6 on the left). 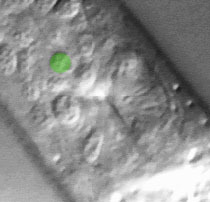 The three nuclei are not usually visible in the same focal plane.